Spices are natural products obtained from the fruits, seeds, roots, flowers or the bark of a number of different trees or shrubs. They contain oils that aid digestion by stimulating the gastric juices. They also enhance the appearance of food and add a variety of flavors. As spices are concentrated in flavor, they should be used sparingly, otherwise, they can make food unpalatable. 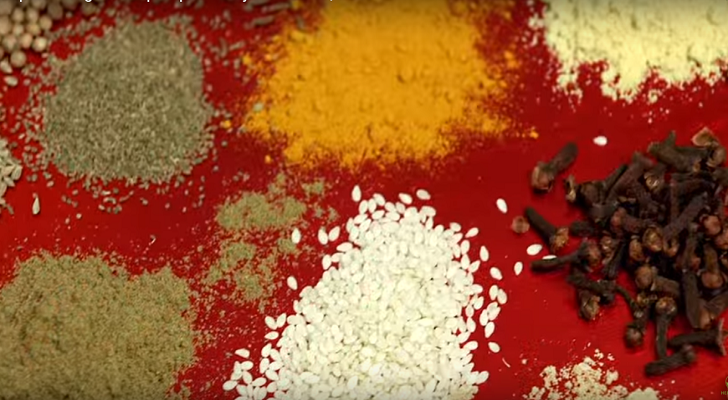 Most spices are grown in India, Africa, the West Indies, and the Far East. Allspice or pimento: This is so called because the flavor is like a blend of cloves, cinnamon, and nutmeg. It is the unripe fruit of the pimento tree, which grows in the West Indies. Allspice is picked when still green and dried when the color turns to reddish brown. Allspice is ground and used as a flavoring in sauces, sausages, cakes, fruit pies, and milk puddings. It is one of the spices blended for mixed spice. Anise: This is also known as sweet cumin, and has a sweet aniseed flavor. It is used for fish, sweets, creams, and cakes. Anise (pepper): A strong, hot flavored red pepper. Anise (star): Stronger than anise, this has a slight liquor ice flavor. Used in Chinese cookery with pork and duck. Asafoetida: This is used in Indian cookery to add flavor to vegetarian dishes. Available in block or powder form. Caraway: Caraway seeds come from a plant grown in Holland. The seeds are about 0.5 cm long, shaped like a new moon and brown on color. Caraway seeds are used in seed-cake and certain loaves of bread, sauerkraut, cheese, and confectionery. Also for flavoring certain liqueurs such as kummel. Cardamom: Cardamom is frequently used in curry; it has a warm oily sharp taste and is also used in some sweets (e.g. rice pudding) and drinks (e.g. coffee and tea). Cassia: This comes in thicker sticks than cinnamon, is less delicate and more expensive. Used in spiced meats and curries. Celery seed: Slightly bitter, this should be used sparingly if celery or celery salt is not available. Chilies and capsicums: These are both from the same family and grow on shrubs. The large, bright-red type are capsicums; these are ground and known as paprika. There are many types of chilies; they vary in taste, color, piquancy, and heat (always test the heat by cutting off a small piece and tasting with the tip of the tongue). The seeds are one of the hottest parts of the chili and they can be removed by splitting the chili in half the scooping them out with the point of the knife. Hands should always be washed thoroughly after preparing chilies because the oils are exceptionally strong and will burn the eyes, mouth and other delicate areas of the body. Chilies are used in many dishes: pizzas, pasta and in Indian, Thai and Mexican cookery. Chinese five-spice powder: Usually consists of powdered anise, fennel, cloves, cinnamon, and anise pepper. Used extensively in Chinese cookery. Cinnamon: Cinnamon is the bark of the small branches of the cinnamon shrub, which grows in China and Sri Lanka. The inner pulp and the outer layer of the bark are removed and the remaining pieces dried. It is a pale brown color and is obtained and used in stick or powdered form, mainly by bakeries and for pastry work. Cloves: Cloves are the unopened flower buds of a tree that grows in Zanzibar, Penang, and Madagascar. The buds are picked when green and dried in the sun until they turn a rich brown color. They are used for flavoring stocks, sauces, studding roast ham joints and in mulled wine. Coriander: Coriander is a pleasant spice obtained from the seed of an annual plant grown chiefly in Morocco. It is a yellowish-brown color and tastes like a mixture of sage and lemon peel. It is used in sauces, curry powder, and mixed spice. Cumin: This is frequently used in curry, is powerful, warm and sweet and has a slightly oily taste. Dill seeds: These are used for flavoring fish soups, stews, and cakes. Fennel seeds: Fennel seeds have a sweet aniseed flavor; used in fish dishes and soups. Fenugreek: Fenugreek is roasted, ground and frequently used in curry; slightly bitter, with a smell of fresh hay. Garam masala: This literally means ‘hot spices’; it is not a standardized recipe, but a typical mixture could include: cardamom seeds, stick cinnamon, cumin seeds, cloves, black peppercorns, and nutmeg. Ginger: Ginger is the rhizome or root of a reed-like plant grown in the Far East. The root is boiled in water and sugar syrup until soft. Ground ginger is used mainly for pastry and bakery work and for mixed spice. The whole root is used for curries, pickles, stir-fry dishes, and sauces. Juniper berries: If these are added to game, red cabbage, pork, rabbit and beef dishes, they give an unusual background flavor. Krachai: A type of ginger with a slightly strange flavor. Nutmeg and mace: The tropical nutmeg bears a large fruit like an apricot that, when ripe, splits. Inside is a dark-brown nut with a bright-red-net-like covering, which is the part that becomes mace. Inside the nut is the kernel or seed, which is the nutmeg. Although the two spices come from the same fruit, the flavor is different. Mace is more delicate and is used in sweet dishes (particularly milk puddings), sauces, soups, vegetable, and cheese dishes. It is also used for mixed spice. Poppy seeds: Poppy seeds are used as a topping for bread, cakes, etc. Saffron: The stigmas from a crocus known as the saffron crocus (grown chiefly in Spain) are dried and form saffron, which is a flavoring and coloring spice. It is used in soups, sauces and particularly in rice dishes, giving them a bright-yellow color and distinctive flavor. Saffron is very expensive as it takes the stigmas from approximately 4000 crocus flowers to yield just 30 gram. Sesame seeds: These are used in Middle Eastern cooking for their acidic lemon/peppery flavor. Deep red-maroon color. Turmeric: Turmeric grows in the same way as ginger and it is the rhizome that is used. It is without any pronounced flavor and its main use is for coloring curry powder. It is ground into a fine powder, which turns it yellow. Turmeric is also used in pickles, relishes and as a coloring in cakes and rice.